I said I was bad at doing this kind of stuff. Didn't think I was this bad. Halloween and Thanksgiving have passed. Christmas is coming, and I have actually added some new products. The word 'mistletoe' is of uncertain etymology; it may be related to German Mist, for dung and Tang for branch, but Old English mistel was also used for basil. Dung Branch. Dookie on a stick. That's romantic. 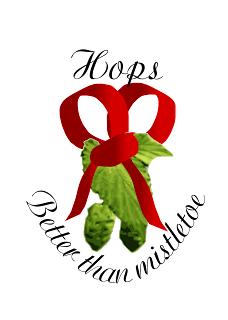 I say replace mistletoe with a mighty bunch of hop cones. If a poo stick can get you a kiss, imagine what you'll get with the fragrance of seraphim. So happy with your new post! Quick witted, brief and to the point. And I really like the new design! Love Ya!